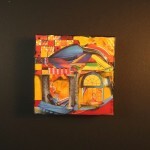 Speakeasy, 5″ x 5″ collage on canvas, $25, from the Affordable Housing series. This entry was posted in More art, Pip's BLOG and tagged art, canvas, collage, Home, House, Marsha Pippenger, miniature art, Ohio Arts Council, painting, paper, small art, speakeasy, storytelling on November 15, 2010 by Marsha. 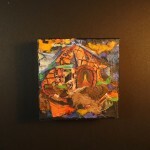 House of Secrets, 5″ x 5″ collage on canvas, $25, from the Affordable Housing series. This entry was posted in Pip's BLOG and tagged art, canvas, collage, Home, House, Marsha Pippenger, miniature art, mystery art, Ohio Arts Council, painting, paper, secrets, small art, storytelling on November 15, 2010 by Marsha. 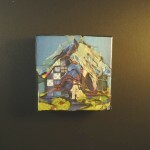 House of Blue, 5″ x 5″ collage on canvas, $25, from the Afffordable Housing series. This entry was posted in Pip's BLOG and tagged affordable art, affordable housing, art, art under $25, blue, blues, canvas, collage, Home, homes, House, Marsha Pippenger, Ohio Arts Council, painting, paper, small art, small collages, storytelling on November 15, 2010 by Marsha. I will be posting new small collages in the Small Works Gallery. These collages are based on subjects rather than full-blown themes. They are less labor intensive and therefore less expensive to purchase. These collages are still finely crafted and treated with the same care as my larger pieces; they are simply less complicated compositions. All are handmade and other papers on canvas, treated with a clear acrylic matte finish so they need no glass, and come wired and ready to hang! This entry was posted in More art, Pip's BLOG and tagged art, canvas, Card Houses, collage, Home, House, Marsha Pippenger, miniature art, painting, paper, small art, small work, storytelling on August 4, 2010 by Marsha.